After the success of the movie "Meet The Fockers" in 2004, Paul Weitz makes a continuation of the previous film is the film "Little Fockers". 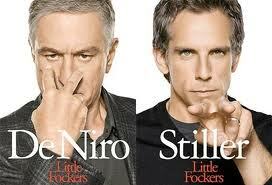 Just like the previous film, Little Fockers movie comedy genre thick, with jokes - jokes mild American-style. Once married to Pam (Teri Polo) and has two twins, Greg (Ben Stiller) tries to prove that he could accept the responsibility given by Jack Byrnes (Robert De Niro). Understandably, all this time Greg was never trusted and considered unimportant by the father-in-law's. At first, all went smoothly for Greg, but problems began to emerge when Greg get a second job as a speaker for a drug that works to cure sexual dysfunction for men. In his new job is, Greg must cooperate with Andi Garcia (Jessica Alba), a man nun who has become the representatives of the pharmaceutical companies. Jack would have thought that Greg was having an affair with Andie Grace be started no longer believed to Greg. Jack is a retired CIA, trying to find out what really happened with the daughter was with spy - spy on Greg. For Greg this is an old problem re-repeated, yet again with the preparation of the birthday of the twins and the presence of Kevin Rawley (Owen Wilson) who is an ex-lover Pam. Little Fockers movie is a light comedy that is quite interesting to watch, and certainly can make you laugh throughout the film. But unfortunately, there are several scenes in the film is not suitable for children - children, so this movie can not be said family film completely.